When editing the quote, a salesperson may limit the shipping methods and shipping addresses visible to a customer. Hover over the More Options menu to the right of the necessary quote and click to start editing its details. Keep in mind that the shipping address you enter when editing a quote will be the only option available for the customer on the checkout. In the Shipping Methods list, select the check boxes next to the shipping methods that you would like the customer to use for this order delivery. When none of the methods are selected, the customer can use any of the listed methods. Once you change the existing settings, the previous configuration will be saved for your information in the Previously Selected Shipping Method log above the list of the shipping methods. If necessary, select the preferred shipping method from the Default Shipping Method list. The customer will be able to change the option to any other available shipping method. To enforce using only the default Shipping method, enable the Shipping Method Locked flag. 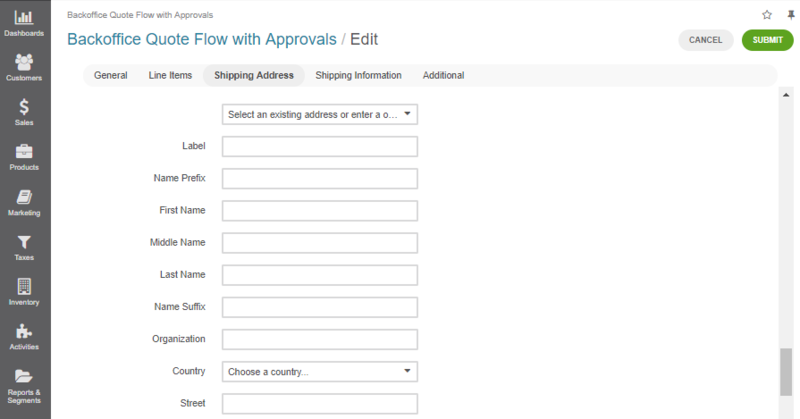 Select the Allow Unlisted Shipping Methods check box to allow using the shipping method that is already selected as a default one, even if it is disabled in this quote configuration.